Mon., Aug. 20, 2018, 8:21 a.m.
A GRIP ON SPORTS • Today was supposed to be about the 7-iron. And the 7-wood. But it seems like golf would be pretty tough to play wearing a breathing apparatus and scuba gear, so it’s off, another victim of our hazardous air. Read on. • There are only so many days in the year to get outside and enjoy the recreational aspects of the Inland Northwest. It’s tough to hike or play golf or go swimming in the middle of December or January or February – for obvious reasons. But summer makes up for it, right? For week after week we can climb to the top of a nearby mountain and view the city or countryside below. For week after week we can frolic or swim in the local pools. For week after week we can trudge around decently priced golf courses, hoping against hope that screaming 5-iron you just hit won’t end up in the woods. It’s summer dreams that sustain us during those January mornings when the ice scraper breaks and the defroster decides to spit out only cool air. Cool air. If it’s without smoke, give me some. Right now. During college, I used to live on the beach. The nights when the fog would roll in were so cool, walking the sands of Newport contained in your own little bubble, hearing the waves crash on the shore but not being able to see them. Sort of like last night on the South Hill. Except the fog was replaced by wildfire smoke, from somewhere in British Columbia according to the folks on the TV. My neighbor across the trail? They could be in Trail, B.C. as far as yesterday evening was concerned. The smoke was so thick, so pea-soup fog-like in its consistency, I couldn’t see their home. The Air Quality Index number rose into the mid-300s, numbers no one around here has ever seen. Anything above 300 is considered hazardous. 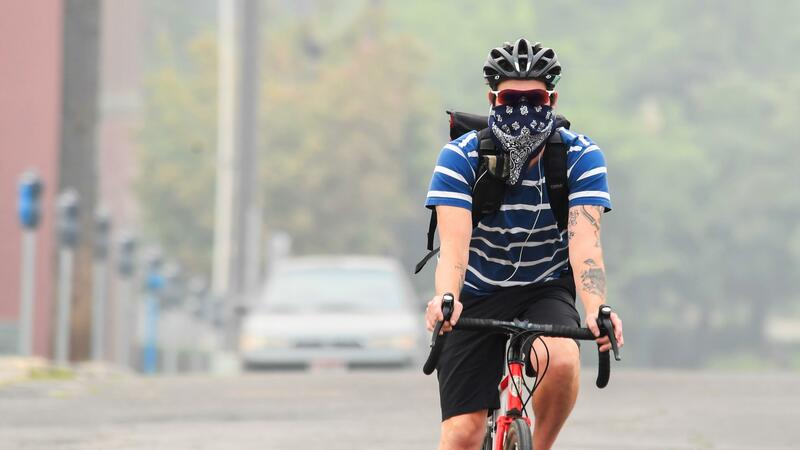 Those of us who are relatively healthy have been warned by the Spokane Regional Clean Air Agency to stay inside. People with health problems? They are encouraged to flee the area. And it didn’t get much better overnight. As I write this, the number is still well north of 300, it is still considered hazardous, the Environmental Protection Agency says Spokane has the worst air in the nation, and my golf game is off. I know, it’s a lot worse for some people. Having grown up in the L.A. area suffering from childhood asthma, I know how it feels to grasp for breath, unable to find it. It’s scary. Be safe today. It also has to be scary for those folks who rely on outdoor recreation for their livelihood. This is the time of year they make enough to stay in business. The awful air must be cutting into their bottom line. We’ve already had two area golf courses – Sun Dance and Antler Springs – announce this is their final year, which isn’t good for those of us who like an unhurried, somewhat unchallenging round. During the summer. You know, when we are supposed to be outside. 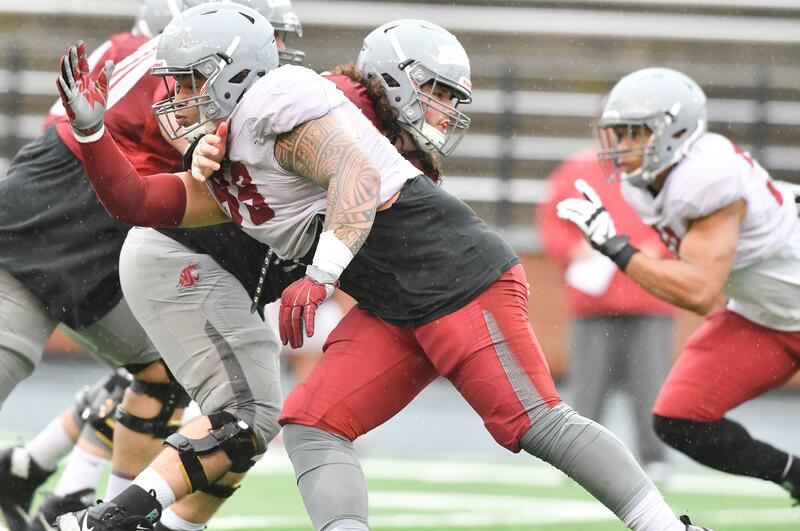 WSU: The air is much better in Pullman – it’s “just” considered unhealthy as of this morning – so the Cougars were able to practice outdoors last night. Theo Lawson was there and found out a touted junior college defensive lineman, Jonathan Lolohea, has left the program. … Theo also has video interviews from coach Mike Leach, safety Skyler Thomas, linebacker Dillon Sherman and receiver Easop Winston. … Former Washington State defensive back Deone Bucannon is biting at the bit to get back on the field for the Arizona Cardinals. … Elsewhere in the Pac-12, there are 11 fifth-year seniors at Oregon State who are on their fourth head coach. It could be worse. How? It could be raining. … A redshirt freshman running back is ready to help Oregon after a year of study. … Stanford has a redshirt freshman linebacker who is in the same spot. … At Colorado, the Buffs are going to rely on a junior college transfer defensive back. … After a couple weeks of just football, schools starts today at Utah. … USC still hasn’t decided on a quarterback. … These are the sad practice stories: UCLA has lost a linebacker for the year to a knee injury. Indians: Vancouver scored four unearned runs in the eighth inning and defeated Spokane 4-0. The Canadians opened a two-game lead in the North. … Around the Northwest League, Eugene earned a walk-off win. Mariners: It was a bad weekend. The Dodgers took two-of-three from the host M’s, including yesterday’s 12-1 rout. Since sweeping the Astros – tonight’s opponent in Safeco – Seattle has lost four-of-six games and are 4.5 games behind Houston in the West and 3.5 behind the Athletics in the wild-card race. … James Pazos was sent to Tacoma yesterday to work on his mechanics. … Eddie Gaedel Day, celebrated at O’Doherty’s Irish Pub, is held in honor of the 3-foot-7 pinch-hitter, once a national celebrity. Yesterday, the eighth-annual festival was observed in downtown Spokane. Seahawks: Half of the preseason games are done. Who will make the Hawks’ roster? … A Seattle safety is now a Storm fan. Published: Aug. 20, 2018, 8:21 a.m.